Here’s the news that many people have been waiting for. Our Village in Bloom team has been advised of the details of the trees and shrubs which are going to planted on the ‘Smart Route.’ 17 trees will be planted directly in the ground. Due to a large underground gas pipe extending from Station Road to Woodcock Lane 10 trees are to be planted in large containers and under planted with attractive shrubs. Below is a plan of where the trees and shrubs are going to be located. It is very detailed, but if you are interested, click on the picture to see the specifics. TP indicates Tree Pit – this is where the trees are going to be put into the ground. PP indicates where the square containers are going to be placed with small trees and shrubs. SC is an indication of the planters which are already in place. 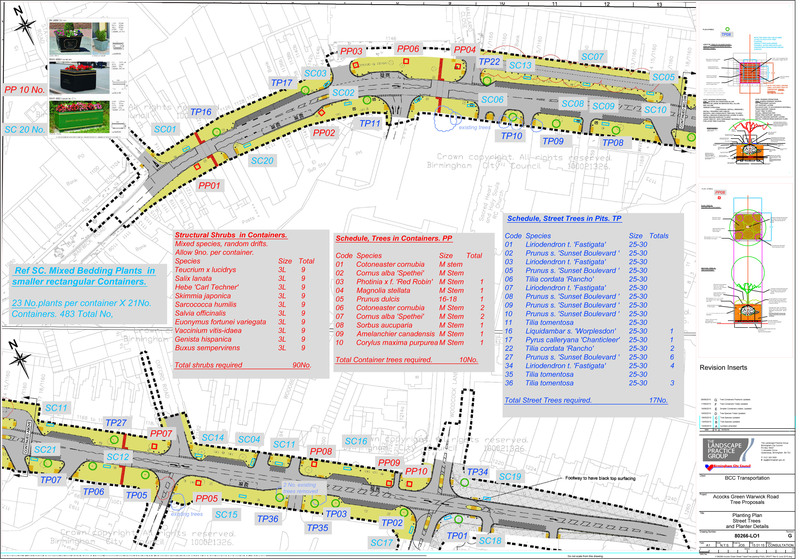 Detailed plan of tree and shrub planting on Acocks Green’s Smart Route – Warwick Road. The council officers have made some good choices and consulted the Bloom team on their preferences. The volunteers expressed a preference for blossom trees and its good so see that there will be several flowering cherry trees. We won’t translate all the Latin names but to give you a flavour – Prunus s. ‘Sunset Boulevard‘ is a flowering Cherry. There are also trees with a tulip shaped flower, a Silver Lime often known as Linden trees, which bears yellow flowers in June/July. Liquidambars worplesdon bears flowers in March/April and fruits in Autumn. In the planters again we have shrubs and trees which will give us colourful leaves including the Photinia x f. ‘Red Robin’ a popular garden shrub. The Cornus has delicate leaves which when fallen reveal colourful stems in the winter. A real favourite with the Village in Bloom is Magnolia Stellata – the Star Magnolia which has star like flowers in the Spring. Amongst the shrubs we will see the Woolly Willow and a Hebe with large blue flowers – good for attracting butterflies. Also the attractive garden favourite Euonymus. There is also Box and Spanish gorse. Salvia has pale blue flowers and is part of the sage family. This excellent mix will provide not only visual interest throughout the year with colourful leaves and flowers and some of them have lovely scents. Most have been chosen for their drought tolerance and hardiness in public places. The trees will be underpinned to provide stability and we have been told that they will not have those unsightly wooden support poles. The ‘official’ opening of the Smart Route is Wednesday 23rd September. Tree planting always takes place in the winter months however and should commence in November/December. This entry was posted in Events and tagged Acocks Green, shurbs, Smart route, Village in Bloom, Warwick Road. Bookmark the permalink.